Not wanting to be outshone by the record-breaking Nintendo Switch launch, Nintendo 3DS fights back for your attention with Mario Sports Superstars. 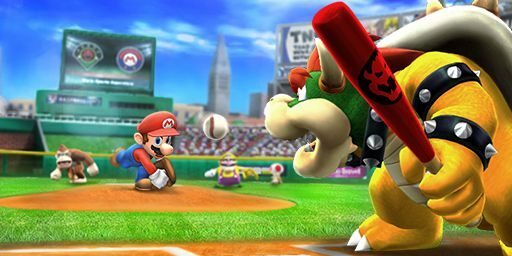 The Italian plumber and his Mushroom Kingdom pals have already shown their sporting prowess in the Mario Golf, Mario Tennis, Mario Superstar Baseball, Super Mario Strikers series, and, in this latest Nintendo 3DS exclusive, they look to further their successes. This compilation, rather impressively, packs Football, Baseball, Tennis, Golf and Horse Racing onto a single game card. And, before I delve into each individual sport, let’s firstly talk about the similarities between them all. Every sport is split between Single Player, Multiplayer and Stats components. The Single Player serves up Tournament, Exhibition and Training modes as well as How to Play instructions, and, when looking to take on other players your options are With People Nearby (Local Play), With Friends Online (Online Play) or With Players Worldwide (Online Play). This breadth is appreciated, but spending an hour with the game will soon show how shallow it is. Tournament mode will see you compete in the Mushroom Cup, Flower Cup and Star Cup, your successive victories unlocking the Champion’s Cup. These aren’t particularly challenging despite some unbalanced and frustrating moments where the game purposefully no longer swings in your favour, and, once completed, there’s no real reason to return. However, it is nice to see the Nintendo Network being once again put to use, and matchmaking works well, with players starting with a 2000 Rating score that fluctuates dependent on your wins and losses. This means that, over time, you will hopefully be facing players with a similar Rating, with other matchmaking options letting you opt for different Match Length and Play Style choices. The character selection screen is also the same across all sports, with plenty of familiar faces. There are 16 characters to choose from initially, whether that be Mario, Waluigi, Boo, Bowser Jr. or Birdo which each have their own classes – namely All-Around, Speed, Technical, Defensive, Tricky or Power. One decision that left me perplexed was the unlockable characters – Pink Gold Peach and Metal Mario – which have to be unlocked within each sport, rather than the player being rewarded across the game. It felt an unnecessary way to elongate your time with the game by making you complete all Cups in each sport, instead of leaving you to play as you please. Now, on to the sports. I had a lot of fun with Football, or soccer to those in North America. 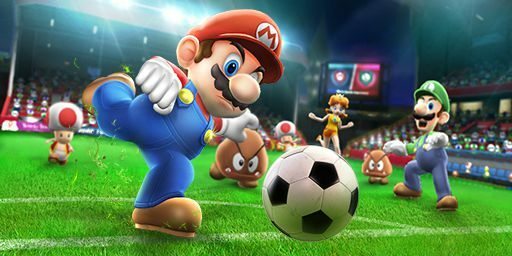 These 11-a-side matches will first see players choose their team captain and assistant captain, before selecting their teammates – whether that be Toads, Koopa Troopas, Magikoopas, Shy Guys, Flying Squirrel Toads, Penguin Toads, Goombas, Bone Goombas, Hammer Bros., Boomerang Bros., or Spikes. And then you can choose either Boom Boom or Pom Pom as your Goalkeeper. Phew. Once on the pitch, everything is as expected. You’ll tackle for possession, pass the ball up the pitch and take a shot on goal, with players able to slam a mighty Special Shot once you have built up enough power by dribbling or shooting. It can get fairly manic on higher difficulty levels as you wrestle for the ball, but the main criticism for this sport is that it all feels rather plain and lacks the sheer madness that was last seen in Mario Strikers Charged Football on Wii, a fan-favourite series that Nintendo has seemingly chosen to abandon. Next up is Baseball, which will see players alternate between pitching and batting. Once again you will choose your team captain and assistant captain, but, unlike Football where your seven teammates are the same character model, you can choose a mixture to join you on the baseball field. When pitching, players can choose between throws such as a Fastball, Screwball, Forkball or Curveball, positioning where they want to aim their throw – stopping a marker in a coloured zone to make sure that they are on target. Your SP gauge will fill over time, and, once full, you can throw a Special Pitch. This will let you unleash your chosen character’s signature pitch, which, if you stop the market in the rainbow-coloured zone, will prove even more of a test for your opponent. If you miss the zone, it will be a regular pitch. Whereas, when batting, players will choose to strike the ball with a Power Swing (A Button) or Contact Swing (B Button) by slamming the respective button once it enters your Swing Zone. The Contact Swing has less power but widens the Swing Zone to make it easier to hit the ball, whereas, you guessed it, the Power Swing can see you land a hit with mightier power but with a smaller Swing Zone to strike it in. Special Moves are also available to you, a short animation seeing your character smack a Home Run if you are successful. There is a constant threat of being caught out, dynamic camera angles building up the tension as the player is kept guessing which way it will go. Given that it is a sport that I know the least about, I have had a lot of fun with Baseball. Lengthier games mean that you become more invested in your team’s performance, even if that comes at the risk of everything dragging slightly. Tennis was where my enthusiasm started to wane, which came as a surprise given how much I had enjoyed Mario Tennis Open back in the day. 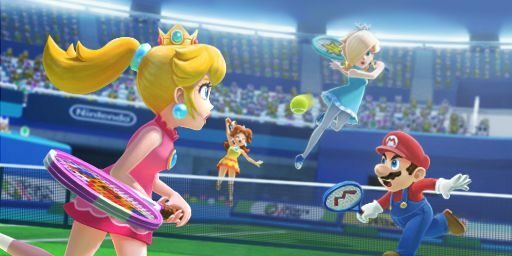 And, after the lacklustre Mario Tennis Ultra Smash, I was hopeful that it could bounce back. Sadly not. This is a half-baked experience that largely feels like recycled content, more than anything. You will play solo in Tournament mode, with Exhibition opening up the chance to play Doubles. Moving around the court, players will serve the ball before relying on different shots as they attempt to catch their opponent out. There are numerous shots to slam across the court, with the game listing Topspin, Slice, Flat Shot, Lob, Drop Shot, Simple Shot, Jump Shot, Strong Shot, Charge Shot, and Leap Shot, while the Ultra Smash is added in. While you are free to rally the ball back and forth until someone wins the point, each shot type has a specific defence, opening up the chance to decrease the ball’s power to give you a temporary window to plan your next move. With four courts to play on, each has a specific bounce and ball speed rating which can lower or heighten the difficulty depending on how confident you feel. But, matches can often result in the CPU winning points in a cheap manner. I have had multiple matches with different opponents, where I was on the receiving end of an Ultra Smash barrage. Matches seemingly wanting to be elongated on purpose, with no opportunity to retaliate. Golf came as another disappointment, and, similarly, Mario Golf: World Tour is to blame. It’s the better game, thanks largely in part to the robust Castle Club mode and access to items such as the Dash Mushroom, Bullet Bill and Fire Flower that result in a far more entertaining experience. Comparatively, Golf in Mario Sports Superstars is uninspired, and a sport that I quickly lost interest in. Strolling on to different courses, players are free to ponder the distance, wind strength and terrain that their ball is sat on, before choosing the right club to use. With Normal and Power shot types to consider, players must then time their button press as a bar runs along the Range Marker. Striking when near the distance chosen will see your ball soar across the course, and, hopefully, land on the fairway, as you look to move within putting distance. While Manual Shots will engage more advanced players, developer Camelot look to switch things up with Stroke Play. Here, players can play up to nine holes and choose environmental settings such as wind strength to make each one trickier. But, while the challenge can be ramped up, for most it will have the opposite effect on your interest levels. Now, Horse Racing came as a welcome surprise. Perhaps after some painstakingly average events in the Mario & Sonic series, I had little hope for this actually being remotely any good. Imagine my reaction when I realised that it was my favourite sport in the entire game. Perhaps that’s because it is made to feel more personal, the Stable mode letting you interact with your horse where you can feed, pet and brush them – with input similar to nintendogs + cats. Players are also free to roam around the nearby field to hunt for items or accessories, which your horse can wear. But, while boosting your horse’s Mood and Bond are important, it is the Crown Race that is the main event. In courses filled with obstacles and hazards, players will leap and gallop their way to victory. 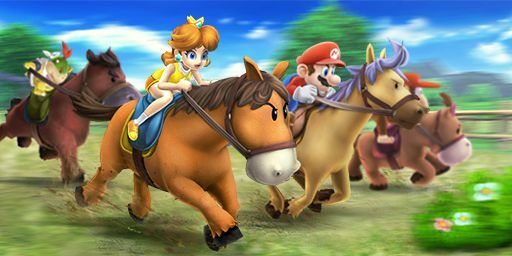 There are 12 to race along, littered with carrots to replenish your horse’s stamina or Stars that will build a gauge toward letting you perform a Star Dash to gain a temporary speed boost. There are tactics at play, though. Your horse will run faster when galloping alongside other horses – referred to as the Herd Effect – meaning that you will need to choose the right moment to gallop away on your own. Whether it’s the similarities to riding Epona in The Legend of Zelda series or not, Horse Racing somewhat redeems the shortcomings that other sports had suffered. There’s also the new Mario Sports Superstars amiibo card range to consider, which, while I’m all for more amiibo in my life, had always seemed an odd choice of game to implement them in. There are 90 cards to collect, five for each character showing them playing each sport. I haven’t had the chance to test them, but, when scanned, they unlock a minigame called Road to Superstar which, if you are successful in, will see that character become a Superstar. That means that their character stats will be boosted, and these can be used across all modes whether single player or multiplayer. Those not wanting to buy amiibo cards can still unlock Star Characters by winning a Champion’s Cup in-game, but these won’t be as powerful as their Superstar counterparts. amiibo cards will also reward you with collectible packs, which can also be bought with Coins earned in-game. There are 324 to collect, spread across six categories – Super Rare, Rare, Normal, Sub Character, Pro Gear, and Horse. I still haven’t worked out whether there’s any particular point to these, however.